It’s something of a no-brainer to claim that Kenya and Ethiopia are the world’s two most distinctive (in other words, most different-tasting) coffee origins. Most cuppers would find it difficult to confidently identify the country of origin of a high-grown Central American coffee without a little help. (“A little too soft for a Costa Rica & Panama? Or maybe El Salvador … or that fruit, could be a Guatemala Coban …”) With Latin American coffees there may be more difference between coffees from different regions of the same country or between different farms within a region than between coffees from different countries. But put a wet-processed Ethiopia on the table and everyone becomes confident quickly. 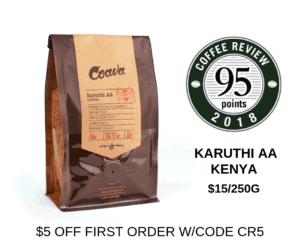 Kenyas, with their dry berry character and pronounced acidity, may be less easy to identify than the extravagantly citrus and floral wet-processed Ethiopias, but they are almost as true to type and easy to recognize. Furthermore, the ratings achieved by this month’s Ethiopias and Kenyas suggest that these origins are not only among the world’s most distinctive, but also among the world’s finest. I cupped thirty-nine African coffees, narrowing the field down to eighteen, which I cupped again with Christy Thorns, Coffee Buyer and Roastmaster for Allegro Coffee. Of the eighteen finalists, seven were Kenyas, six Ethiopias (all wet-processed, five Yirgacheffes and one Sidamo), two Zambias, one Tanzania, one Malawi, and one Uganda. The six Ethiopias averaged close to 90 and the seven Kenyas around 88. I certainly don’t recall such a strong showing from any other coffee origins we’ve cupped over the years. Of the seven Kenya finalists three ended up with 90 ratings; an amazing four of the six Ethiopias rated 90 to 91. Of the five coffees from elsewhere in Africa, only the Tanzania distinguished itself, at 88. The reasons behind the failure of these less famous origins to score better are familiar. For one, all except Uganda are located south of the Equator rather than north, meaning their harvest was about a year ago during our summer (their winter). Consequently the green coffees from these origins were a bit old and faded by the time they were roasted and we cupped them. Secondly, it doesn’t seem that the best of these Central and Southern Africa origins are making it to North America. I led a cupping of Zambias a year or two ago in London and tasted some very impressive coffees, not one of which appeared to be imported into the United States at that time. I went out of my way to find a co-cupper for this article, smelling success for these coffees and fearing that someone out there might acquire the idea that I am partial to East Africas. In fact, I may be, if partiality means that they tend to taste good to me more often than samples from many other origins. However, if that is partiality, then it appears to be shared by my colleague Christy and (if I hear the buzz right) by many of my other cupping colleagues as well. Ironically, the strong showings of Ethiopia and Kenya come as both coffee industries are under tremendous stress. Ethiopia’s problems are relatively simple to understand. Because the Ethiopian coffee industry, like many others, depends mainly on the work of small-holding farmers with virtually no access to technology and a limited supporting infrastructure (most Ethiopia farmers literally must carry their coffee to the mill on their heads), production costs are relatively high. And, as we know, prices paid farmers for green coffee are now at an all-time low. Which means that, for Ethiopia, income from the sale of coffee simply does not cover the total cost of production. On the positive side, Ethiopia’s plight finally has attracted the interest of aid agencies, which are rather belatedly beginning to direct money and support to the Ethiopian coffee industry. The success of the Fair-Trade certified Oromia Cooperative, with over 7,000 members spread over most southern and western growing regions, is another positive sign. The Cafe Campesino Oromia Yirgacheffe impressed with a rating of 90 in this month’s cupping. Kenya’s dilemma is murkier in origin and outcome. Although Kenya’s great coffees mainly are grown by small-holding farmers organized into cooperatives, Kenya’s finest coffees attract substantial premiums. These premiums have shrunk as world coffee prices have dropped, but prices currently paid for the best Kenya coffees appear to be enough to keep farmers in business. The problem is the premiums do not seem to be getting back to the farmers. Kenya’s specialty industry is organized around a famous and, at one time, quite successful system of government-run auctions. Exporters send samples of auction lots from the cooperatives to buyers in producing countries, who then instruct the exporters to bid up to a certain price per pound for their favorite lots. For most of the years since this system was instituted, it has worked well, both for coffee buyers, who were able to compete in an open and transparent system for their preferred lots of Kenya coffee, and for the best farmers and cooperatives, who were rewarded for their efforts with top auction prices. For the last several years, however, farmers have complained that a good deal of the premiums paid for their coffees never get back to the farm. At times their complaints have taken on a violent edge. The government responded a couple of years ago with firings of officials and a reduction in the control of the coffee-regulating bureaucracy, but the complaints continue, and Kenya’s coffee output has plummeted. From this distance it is difficult to figure out who the players are and what they stand for, but the turmoil persists and the government’s efforts to deal with it appear, at best, complacent and sporadic. For better or for worse, Kenya appears headed toward an open market system in which producers and exporters are free to cut their own deals. The danger, of course, is that free may not really be free, and the channels to market still may be manipulated in some way by those with something to gain by doing so. Nevertheless, it appears that in both Kenya and Ethiopia hard-won traditions of sound artisan coffee production continue to prevail, at least for the top end of the market. Couple the resulting clean, taint-free cup with the serendipitous contributions of soil, climate, Kenya’s high growing altitude and Ethiopia’s heirloom native coffee varieties, and the aficionado still has extraordinary coffees from both origins to sample and enjoy. The finest coffees from both are cultural treasures that appear to be surviving mainly owing to a network of savvy green coffee buyers coupled with a heroic devotion to task on the part of growers.